What says winter fun more than SNOWMEN? They're cute, cuddly, and simple to make, too. 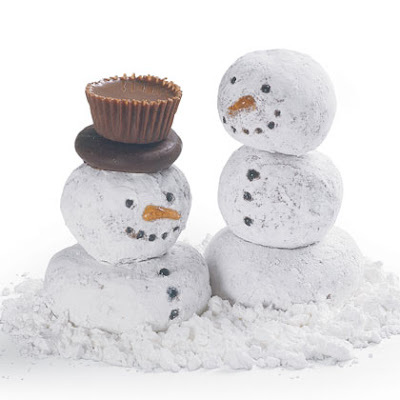 From desserts to ornaments to crafts and more, snowmen are everywhere on creative blogs and websites this year. 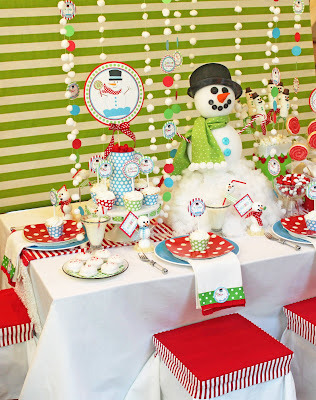 With so many adorable and inspirational ideas out there, it's a great time to throw a Winter Wonderland party, a fun Brrrrr....thday party or to invite some neighbor kids over to have a few treats and make a snowman craft. 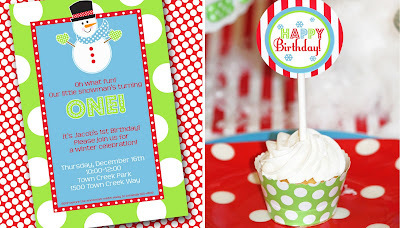 Using the Amanda's Parties To Go's Christmas snowman printable collection makes it easy to turn your home into a winter wonderland quickly, too. The collection includes all the party items you'll need from cupcake toppers to food label cards, signs and more. And don't forget about the Winter ONEderland birthday collection and the perfect party Snowman Invitation. Isn't it cute?? A little red, blue and green.... some stripes, some polka dots and of course, a whole lot of cutie-pie snowmen, and you've got a fun and festive gathering. 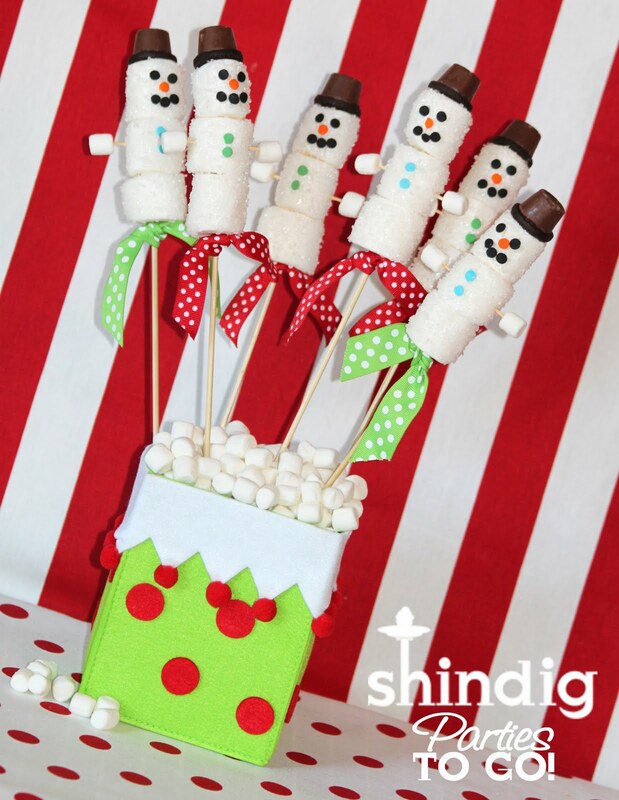 Wouldn't Shindig's Marshmallow Snowman Treats be fun to make for the party, too? They're really simple.... even the kids could do it. And look at "Defrosty the Snowman" from Yum Sugar. It just makes me laugh - adorable! It's just melted white candy coating, some mini chocolate chips, a rolo and a candy corn. Sounds simple to me. Wow! 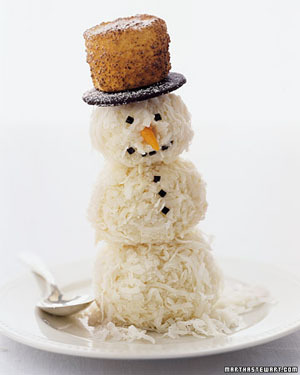 How creative -- a snowman smore from The Adventures of Mrs. Reagan. Perfect for a fun party activity, too. 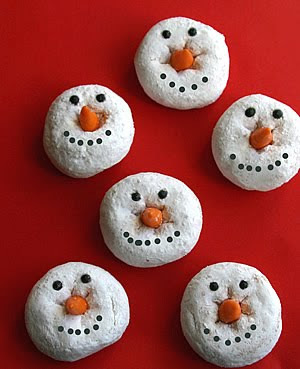 How easy and cute are these snowman desserts from Better Homes and Gardens using a ...... get this..... Hostess Sno Ball! Yep, it's that easy. Roll a marshmallow into a ball and insert a toothpick for the head. 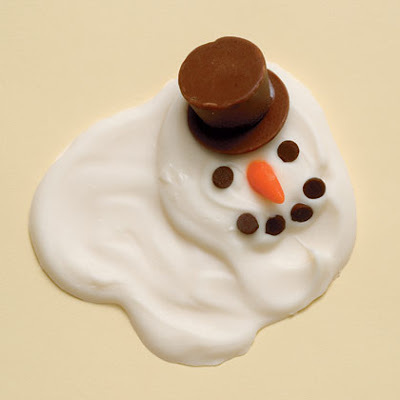 Use some food markers to make a cute face and waa-lah..... adorable snowman dessert. 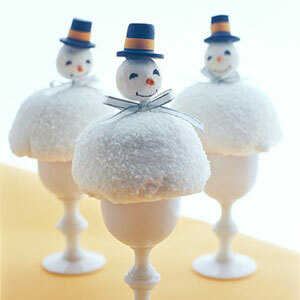 And look at these great ideas for snowmen centerpieces or even punch bowls. The first one is from Chris at Celebrations at Home. 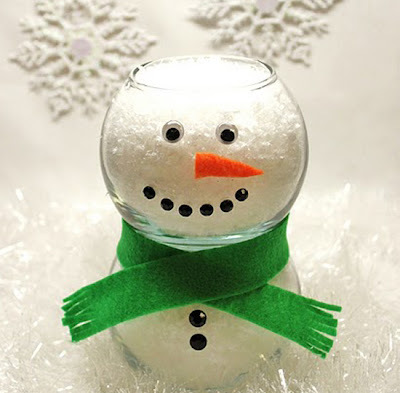 Chris uses mini fish bowls, some felt, googley eyes and adhesive gems to create this adorable little snowman centerpiece. 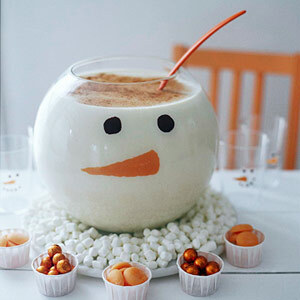 And how great is this snowman punch bowl from Better Homes and Gardens? Surrounded by mini marshmallows and filled with everyone's holiday favorite eggnog, this is a great example of how fabulous doesn't have to mean time consuming or expensive. 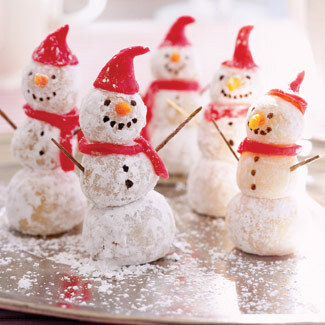 Marzipan powdered sugar snowmen from Good House Keeping are almost too cute to eat. If you don't want to use marzipan, I think you could re-create something similar using powdered doughnut holes like the next couple of cuties. Very Heatherly has one cute version with lots of added powdered sugar for snow. And Family Fun's even simpler version would be perfect for preschoolers. Coconut-rolled ice cream desserts from Martha Stewart bring a whole new meaning to Cake and Ice Cream! 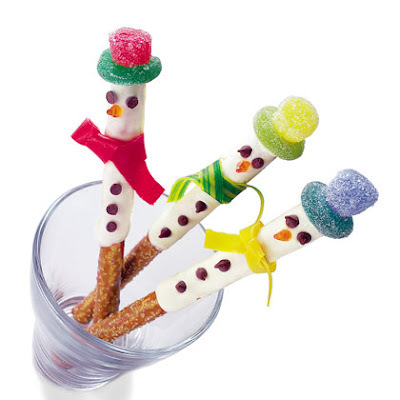 Snowman Pretzel Sticks from Family Fun would be a fun party treat, or wonderful to wrap in cellophane and give out as favors at the end of your winter party. 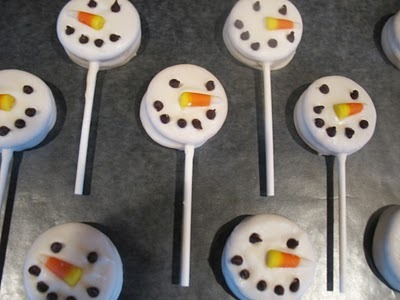 Snowmen Oreo Pops from This Chick Cooks would make a great party favor, too. 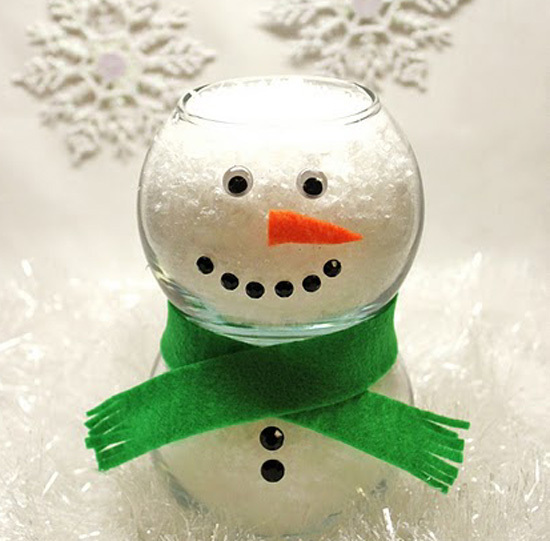 has an adorable idea for gifts or party favors.... Snowmen head mason jars. 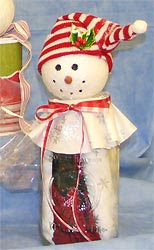 And another mason jar snowman favor bottle can be found at Weeping Cherries. These would be adorable to send home full of candy or other treats for your guests or maybe even a fun craft for the older kids at the party. 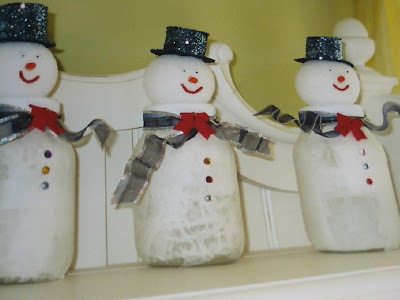 I hope these ideas inspire you to throw your own Winter Snowman party or maybe just to take an afternoon and make a fun treat with the kids. 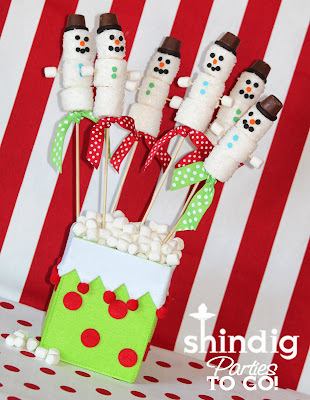 Stay tuned for even more cute snowmen ideas tomorrow! Yea! Thanks for the shout out! :) Everything is so adorable! I love the puddle snowman too! i love these! i think i might be making some before christmas! thank you for the great ideas! Yes, but it is essential that newly trained operators are give specific job and familiarisation training, tailored to the employers own needs. Forklift Load Back Rest Ih Ahlmanngas Greensboro Warehouse Forklift Driver Fulltime Employment In Arlington You see, you don't want to take a sick day off work, or do forklift training when you don't want to.